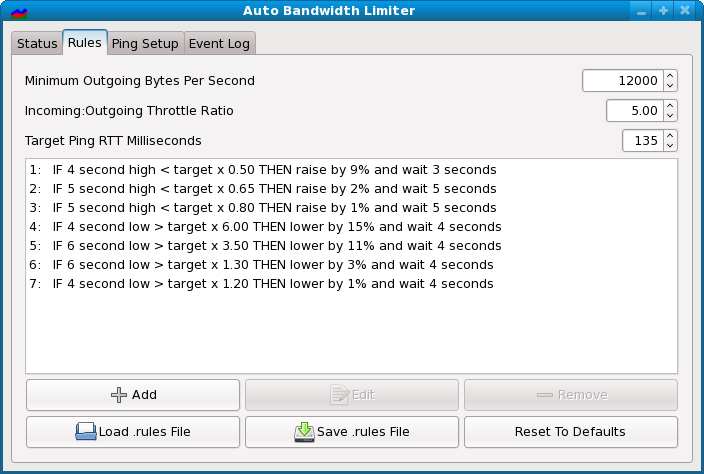 The Automatic Bandwidth Limiter feature is intended for use with Cable/DSL internet connections. It uses ICMP pings to measure congestion and adjusts the bandwidth throttle to maintain a rate just below full capacity. You can access this feature from the Bandwidth View, by clicking the 'Details' button. This feature may not work on all internet connections. If you are having problems getting this to work, it is best to not use it and simply set a reasonable outgoing throttle rate as described on the Optimizing Tixati page. Cable and DSL modems often have a large send buffer, which can hold approximately two seconds worth of outgoing traffic. The equipment on the other side of the connection (DSL line card or Cable head-end) also has a large buffer that can hold about two seconds worth of data before it is transmitted in the opposite direction, to your home. Because of this, when you are utilizing 100% of your connection speed, these buffers fill up and delay ALL traffic, and this can impact performance significantly. The solution is to limit traffic flows to just under full capacity. This keeps the buffers in a near-empty state, and keeps latency (delay) to a minimum, which allows downloading, web browsing, and almost any other activity to proceed without hindrance. 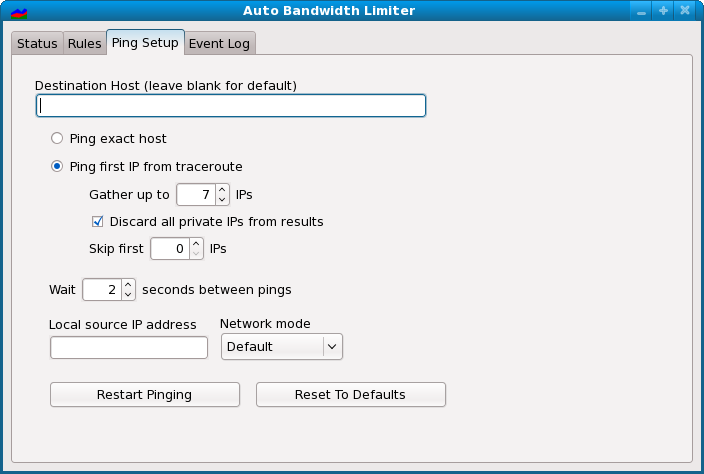 First, a traceroute is used to find the first publicly-addressed router between your computer and the rest of the internet. This router is then pinged every two seconds and the high and low ping times are applied against a set of configurable rules that determine when to raise or lower the bandwidth throttle. The status section allows you to start and stop the automatic adjustments, and shows several pieces of information about the current state of the throttle and the ping measurements. The lower right side of the window shows the current throttle state. 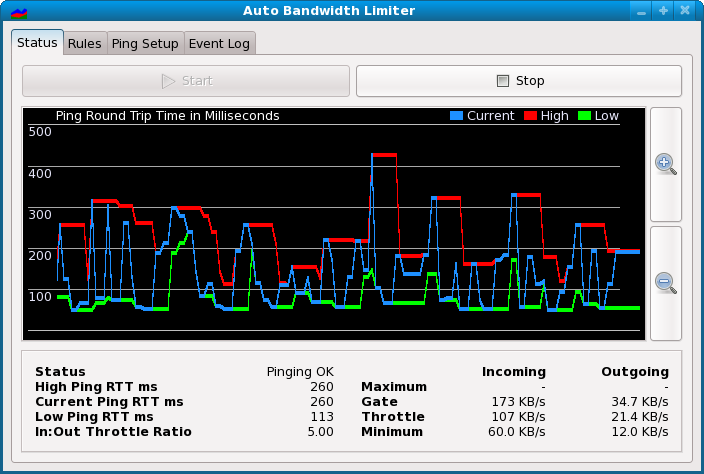 The 'Maximum' is the user-configured maximum rate set in the Bandwidth View. The 'Gate' works as a secondary maximum, which keeps the throttle from being raised more than 20% above peak traffic levels within the past 90 seconds. This stops the throttle from climbing out of control when traffic levels are below the current 'Throttle' and latency is low. The 'Minimum' can be changed under the Rules tab. These are the rules that determine when the throttle is raised or lowered based on ping times. You may have to experiment with different target ping times and In:Out throttle ratios to suit your internet connection. These should work well for most users. This is the same as the standard rules, except the target ping is 170ms instead of 135. This is the same as the standard rules, except the target ping is 120ms instead of 135. The In:Out ratio is 6.5:1 instead of the standard 5:1. This may work better if your internet connection has a very small upload capacity compared to the download capacity. The In:Out ratio is 8:1 instead of the standard 5:1. This is for users with extremely small upload capacity. These rules adjust the throttle more slowly than the standard rules. Use these if your throttle is oscillating too much. These rules have a narrower window of tolerance for ping times, and will adjust the throttle more often and quicker than the standard rules. Use these if you need more aggressive adjustments. These rules are experimental, and work using average ping times only instead of the high/low system in the other rule sets. Most users have poor results with these rules. This tab allows you to change the way traceroute and ping are used to measure latency. Changing these settings is not recommended.